The New York Times has an Editorial Board op-ed regarding the U.S. Supreme Court's decision in Obamacare II at The Supreme Court Saves Obamacare, Again - NYTimes.com. We agree with their assessment, but it is substantially more political than the Greely piece referred to in the previous posting. To get away from all the biased partisan assessments online of the U.S. Supreme Court's most recent decision on Obamacare see On King v. Burwell and the Survival of the Affordable Care Act « Stanford Lawyer. "On March 23, 2010, I sat down at a table in the East Room of the White House and signed my name on a law that said, once and for all, that health care would no longer be a privilege for a few. It would be a right for everyone. This law worked. It's still working. It has changed and saved American lives. It has set this country on a smarter, stronger course. If that means something to you today, add your voice here. This morning, the Supreme Court upheld one of the most critical parts of health reform -- the part that has made it easier for Americans to afford health insurance, no matter where you live. If the challenges to this law had succeeded, millions would have had thousands of dollars in tax credits taken away. Insurance would have once again become unaffordable for many Americans. Many would have even become uninsured again. Ultimately, everyone's premiums could have gone up. Because of this law, and because of today's decision, millions of Americans will continue to receive the tax credits that have given about 8 in 10 people who buy insurance on the new Health Insurance Marketplaces the choice of a health care plan that costs less than $100 a month. If you're a parent, you can keep your kids on your plan until they turn 26 -- something that has covered millions of young people so far. That's because of this law. If you're a senior, or have a disability, this law gives you discounts on your prescriptions -- something that has saved 9 million Americans an average of $1,600 so far. If you're a woman, you can't be charged more than anybody else -- even if you've had cancer, or your husband had heart disease, or just because you're a woman. Your insurer has to offer free preventive services like mammograms. They can't place annual or lifetime caps on your care. And when it comes to preexisting conditions -- someday, our grandkids will ask us if there was really a time when America discriminated against people who got sick. Because that's something this law has ended for good. Five years in and more than 16 million insured Americans later, this is no longer just about a law. This isn't just about the Affordable Care Act, or Obamacare. This is health care in America. Today is a victory for every American whose life will continue to become more secure because of this law. And 20, 30, 50 years from now, most Americans may not know what "Obamacare" is. And that's okay. That's the point. Because today, this reform remains what it always has been -- a set of fairer rules and tougher protections that have made health care in America more affordable, more attainable, and more about you. That's who we are as Americans. We look out for one another. We take care of each other. We root for one another's success. We strive to do better, to be better, than the generation before us, and we try to build something better for the generation that comes behind us. And today, with this behind us, let's come together and keep building something better. That starts right now. It is a great day for America. The Supreme Court of the United States (SCOTUS) has upheld The Patient Protection and Affordable Care Act ("Obamacare") in a 6-3 vote of the nine Justices. Read the majority opinion and dissent at SCOTUS. We anticipated both the result and the reasoning of the holding in this case in our previous LawPundit posting of June 21, 2015 in Does Upholding Dewsnup in Caulkett Mean Obamacare Will Be Saved by the U.S. Supreme Court? The majority opinion was written by Supreme Court Chief Justice John Roberts, joined by Justices Ruth Bader Ginsburg, Stephen Breyer, Sonia Sotomayor and Elena Kagan, and to his great credit now, after dropping the ball on the first SCOTUS Obamacare case, by Justice Anthony Kennedy, who thereby returns to our good graces. When the going gets tough, the tough get going ... and do the right thing. Well done, Justice Kennedy! Kennedy's shift to the majority from his minority stance in the first Obamacare case is in our opinion a strong signal that Obamacare-opponents are playing a losing game in their attacks on Obamacare. The "terrible trio" of Justices Antonin Scalia, Clarence Thomas and Samuel A. Alito Jr. dissented, suggesting that they have learned little since the first Supreme Court Obamacare decision, in which they were also in the minority. It would be good if these three Justices would at some time in their careers rise above their personal political prejudices and private intellectual theories about law and the Constitution and be the wise and impartial Justices they should be, but are not, in deciding matters of great importance to the nation. The U.S. Supreme Court should never overturn major laws as passed by Congress for linguistic hair-splitting reasons, and we say this as co-author of a dictionary, who knows how difficult pinpointing the meanings of words can be in reality, and how little proper attention is paid to linguistic detail in lawmaking. If the nation ultimately wants it, nothing prohibits Congress from repealing Obamacare, which is unlikely, however, since it has been a success. What Scalia writes in his dissent -- even resorting to calling Obamacare "SCOTUS-care" -- is ridiculous, and unfit for a Supreme Court Justice. Not worthy of that position. "The Affordable Care Act contains more than a few examples of inartful drafting. Several features of the Act's passage contributed to that unfortunate reality. Congress wrote key parts of the Act behind closed doors, rather than through "the traditional legislative process." Cannan, A Legislative History of the Affordable Care Act: How Legislative Procedure Shapes Legislative History, 105 L. Lib. J. 131, 163 (2013). And Congress passed much of the Act using a complicated budgetary procedure known as "reconciliation," which limited opportunities for debate and amendment, and bypassed the Senate's normal 60-vote filibuster requirement. Id., at 159-167. As a result, the Act does not reflect the type of care and deliberation that one might expect of such significant legislation." That was, as we predicted, the essential and critical core of the case. Congress passed the Affordable Care Act to improve health insurance markets, not to destroy them. If at all possible, we must interpret the Act in a way that is consistent with the former, and avoids the latter. Section 36B can fairly be read consistent with what we see as Congress's plan, and that is the reading we adopt." Exactly. Right on the money. That is good, solid jurisprudence. Bravo, Justice Roberts and bravo to the majority on the U.S. Supreme Court! Roberts and the majority of Justices have done their job, which is to interpret laws rationally. The minority trio have -- again -- dropped the ball. Kriston Alford McIntosh, Managing Director of The Hamilton Project, an economic policy initiative at the Brookings Institution, reports that the Hamilton Project on Tuesday, June 23 (today) is hosting a policy forum on "Promoting Financial Well-Being in Retirement," from 1:30-4:30 pm at the Brookings Institution in Washington, D.C. Various luminaries will be present. La Ciudad Perdida, "The Lost City", also known as Teyuna or Buritaca, is located in the Magdalena Department of the Sierra Nevada de Santa Marta, Colombia, South America, and has the GPS coordinates 11°2′16.79″N 73°55′30.69″W. It predates Machu Picchu in Peru by many centuries and has one of the most magnificent ancient megalithic stones we have seen. The Global Heritage Fund (GHF) in partnership with the Colombian Institute of Anthropology and History are involved with the management, documentation, and conservation of the Teyuna-Ciudad Perdida Archaeological Park. Archaeology magazine, Volume 57 Number 5, September/October 2004, has an article by Toby Muse titled Lost City, who writes about Ciudad Perdida that the native inhabitants of the region, the Tairona (also written "the Tayronas"), call the center of their extremely remote 15000 square mile area in the Sierra Nevada "Teyuna", "the HEART of the world", even though its first modern discoverers called it a "green hell" for its ever-present mosquitoes, thick impenetrable jungles, and densely covered steep mountains. Even today tourists can not get to the "Lost City" independently but only as part of organized ca. 4-to-5-day hiking tours, which reportedly cover anywhere from 23 kilometers to 44 kilometers of extremely tough jungle hiking, including river crossings and very steep terrain. Suited only for the very fit! "Lost City Colombia - Ciudad Perdida was discovered in 1976 by a team of archaeologists from the Colombian Institute of Anthropology led by Gilberto Cadavid Luisa Fernanda Herrera.... Recent (2006) Archaeological investigations at the site indicate that this town was founded around 660 AD and abandoned sometime between 1550 and 1600 AD.... 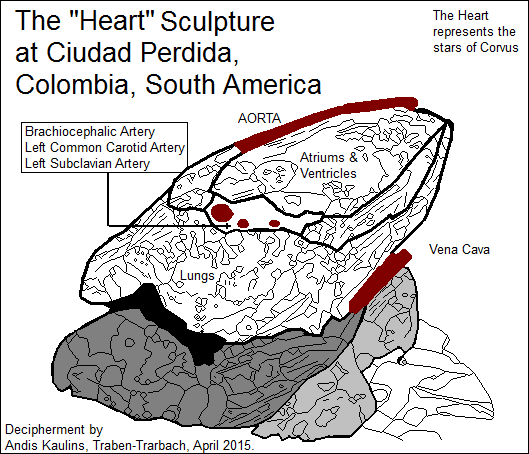 It is known as Teyuna by Indians...."
According to our analysis of the ancient land survey of Native America by astronomy, the Lost City of Santa Marta represented the stars of Corvus seen as a "heart", as evidenced in the large arguably "heart"-sculpted stone at the main location of the site. Perhaps these stones were at some time also viewed as a toad, or frog, as seen in those or neighboring stars by Inca cosmology. See also http://commons.wikimedia.org/wiki/File:YAEL_PHOTOS_898.jpg, which appears to be a similar stone at a different location in Ciudad Perdida. Ciudad Perdida also has a fantastic megalithic "sky map stone". See http://commons.wikimedia.org/wiki/File:YAEL_PHOTOS_819.jpg. That megalith is currently thought to have been a "local" map of the region, created using a "slashed line" stone marking technique also found in the Pacific Northwest, e.g. in Oregon (name origin via "Virgo", so we allege) and Alaska. Note that in Inupiaq Eskimo language an inuksuk was "a native Alaskan cairn built to mark pathways". See Behind the Name. On one level that is what the ancient land survey of Native America by astronomy was all about. This has to be one of the most spectacular of all the megaliths we have thus far seen, apparently carved in the shape of a human head, with the top of the head as the stars of Centaurus and the chin fairly clear, but with asymmetrical star-mandated positioning. We see the eyes at Volans and Musca, the cheek at Carina, the nose at Mensa and the mouth at Reticulum, which then makes LMC, the Large Magellanic Cloud the moustache. Obviously, the ancients created these anthropomorphic figures in the stones to mark the stars and to make it easier to remember them, just as we do today with the stellar constellations. We found the Colombian and Alaskan megaliths by following an "idealized" diagonal line of land survey by astronomy that runs northwest to Alaska from the Herschel Petroglyphs and southeast from the Herschel Petroglyphs through Cahokia to the Miami Circle and approximately through Ciudad Perdida, and then on to the far east coast of South America. We think that this line could be marked as one of two lines marked at the bottom of the Cahokia Birdman Tablet that are perpendicular to the ca. seven horizontal levels found there, which mark the main horizontal survey levels on land in North America. We will post about how that land survey may have looked in a coming posting. 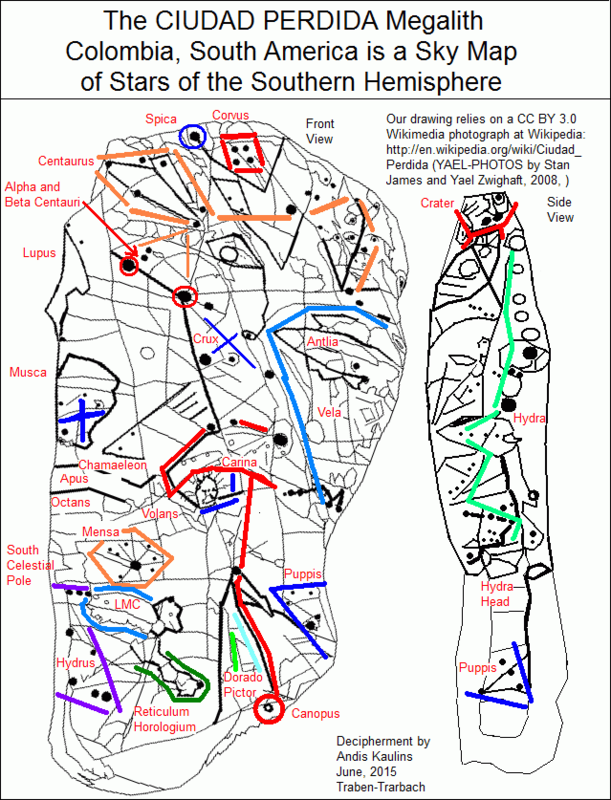 We emphasize again that the ancients may not have used totally straight lines in doing their astronomical land surveys, but rather line and/or angle approximations that were guided by measurements of the stars, Earth topography, resulting Indian trails and other practical considerations. Nevertheless, such lines are useful for analysis in practice for us in doing the decipherments. Exactly what the ancients did still remains open. Upgrading to Windows 10? How About the Option to Defer? Dinner as a sound investment. Dining with Warren Buffett for charity millions has turned out for some to be a very sound investment. The Financial Times has the story.